Video footage captured on the morning of Friday, February 12, 2016 shows thousands of blacktip sharks off the beach in Palm Beach, Florida up to Jupiter. 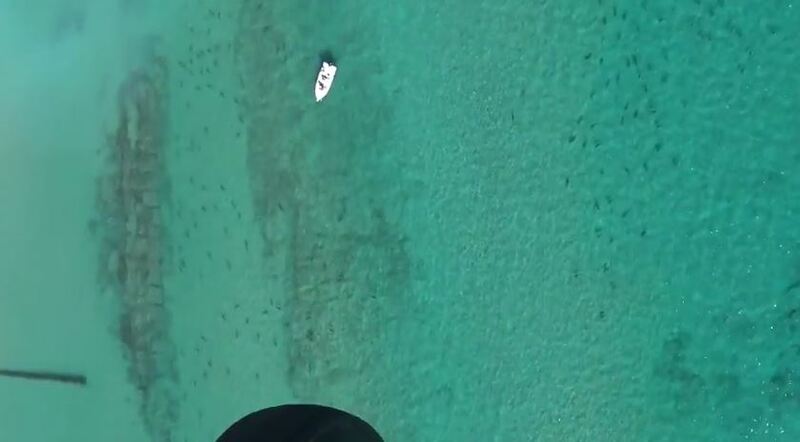 Florida Atlantic University biological sciences professor Stephen Kajiura spotted the sharks while filming his weekly aerial black tip shark migration surveys which covers the coastline from Miami Beach north to the Jupiter Inlet. The sharks migrate from as far away as North Carolina, on their way to the warmer waters surrounding Florida for the winter. It's important to understand the extent, range and impact of their migrations because of the sharks' significant impact on South Florida's marine environment. Kajiura has been studying shark migration since 2011.